It's Christmas today. And until New Year's day, the Al Ain Hilton and InterContinental hotels will be home to 30 teams participating in the first Asia Club Cup thanks to Sheikh Sultan Bin Khalifah Al-Nehyan, President of the Asia Chess Federation. Frankly I am mentally and physically exhausted after almost non-stop travel including most recently attending the Chess Olympiad in Dresden followed by coaches seminars in Bali and Sri Lanka and then to return home to organise the KL Open Championship, so what do I do for rest but end up here in Al Ain, UAE as part of an quickly put together ASEAN team under the Club INTCHESS banner playing in the first Asia Club Cup! I am the captain and Board 4 of a team that is surprisingly seeded eighth with GM Bui Vinh of Vietnam, IM Julio Catalino Sadorra of the Philippines, IM Tirto of Indonesia the "serious" players and owner Ignatius Leong of Singapore, like me, the old "patzers" trying to hold up the last board between us. Our competition? Well, for example the top seeded Al Ain Chess Club has an average rating of 2679 and GM Li Chao of China is only the alternate! And in the second favourite team, GM Ghaem Maghami Ehsan is on second board for the Teheran Chess Club but is actually only the fourth ranked player on the team. We also have essentially the national teams of China, Philippines, Uzbekistan and Vietnam ranked third to sixth. More relevantly, the team seeded above us, the Chennai Chess Club is well ahead of us with 4 IM's averaging 2432, and the Mongolian team just below us is not too different from their national side as well! So with me as the weak link (Ignatius Leong will only be around a few days), on paper at least we seem to have a chance and are of course hoping to win our group by finishing seventh! Yes, the enduring optimism of chess players which often suspends reality! Such is the beauty of chess competition. And who knows, Christmas is a season of giving (and so some must be receiving!). KL Open - Begining of a New Chapter for Malaysian Chess? The KL Open Chess Championship has ended - on a high with a very memorable Closing and Prize Giving Ceremony at the Legend Hotel - and by any standard is happily a great success. The buzz this event generated ensured that FIDE General Secretary and ASEAN Chess Confederation President Ignatius Leong flew in from Vietnam and that the Malaysian Chess Federation (MCF) would be fully represented by both its non chess playing President and slighly more adept Deputy President. The Crown Prince of Perak, Dr Raja Nazrin Shah was at hand to give away the prizes which included the challenge trophy that he allowed to bear his name and that is indeed significant as he himself was not only a chess player in his Oxford days but is also someone who is very particular about his associations, being conscious of his standing and leadership role amongst the both the "rakyat" and his fellow monarchy. I once played a game with Raja Nazrin, over 20 years ago after being introduced by a mutual friend as the national champion, and of course I beat him, not with too much difficulty (he was about a 2000 rating then) but only by just converting an advantage in the endgame and together with the polite noises one makes after losing (he was not a prince then and his father was still Lord President of the Supreme Court) I did not miss the gentle remark that as Malaysia's top player I should have done much better! This says a lot about the man and the respect he commands. Kudos to Edmund Santhara, President of KL Chess Association and CEO of Masterskill (a real chessplayer who even attributes his success in the corporate world to strategic thinking he has developed from being a chessplayer!) which was the main sponsor, a big thank you to MCF Secretary Gregory Lau for ensuring smooth relations and close cooperation for an event that cannot be anything but good for Malaysian chess, and of course to the relatively inexperienced but hard working and always willing team put together by Chief Arbiter Latiff Mohamad. As Tournament Director I must also thank my friends Butch Villavieja from the Philippines and Dawn Hui from Singapore for helping out in key roles and especially ASEAN Chess Confederation Secretary-General Sebastian Simanjuntak from Indonesia who not only brought a huge and representative delegation from Indonesia but also found time to help out in so many ways while playing and winning a big prize he prompty donated! There were many firsts, from having 11 countries represented, prizes for the visually handicapped, supporting events like the simultaneous exhibition between the VIP Tournament Guest of Honour and a National Junior Selection, the enthusiastic participation of numerous titled players despite a modest prize fund, two players becoming a Grandmaster and an International Master respectively, numerous young players getting rated, and many of these details can be found by going to www.klchess.com. 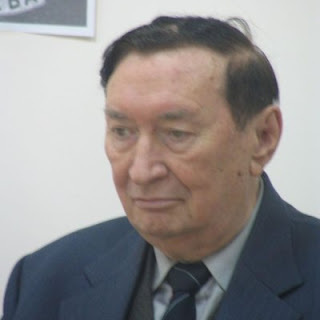 International Master and International Arbiter Nikola Karaklajic of Yugoslavia and Serbia, a true chess great and someone I was privileged to have met and spent a great deal of time with, has passed away on December 16 at the age of 83. "He was one of the most important figures in Yugoslavian and Serbian chess. Player, writer, trainer, organizer, arbiter, journalist, chess ambassador - it is not easy to sum all his achievements." Outside of chess he held a fulltime job and was a multi talented individual with so many firsts including being a radio DJ who very early discovered the Beatles and brought their music to the young people of his country! Personally I owe him a lot as he taught me what was important in chess and he was a very kind and good friend indeed. When I was in Belgrade in the 80's trying to understand what was the system of training used by Yugoslavia (at that time the number 2 chess nation in the world after the Soviet Union) I stayed with him in his cosy little apartment and he not only facilitate my research at the federation's offices and with clubs and players but would also find time to personally show me many aspects of life in his truly beautiful country. More details of his life can be found at: http://www.fide.com/component/content/article/1-fide-news/3609-in-memoriam-im-nikola-karaklajic. Sir, you lived life as everyone should - and fought the good fight indeed - we who have had the honour of meeting you and perhaps the privilege of knowing you do congratulate you! Yup. 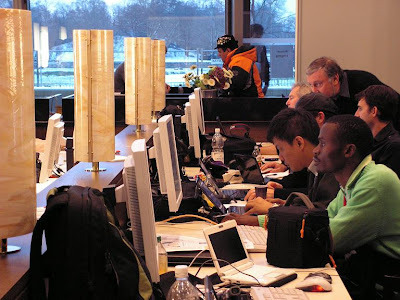 That's me working in the Press Centre. One of best places to be with Internet access and live game feeds, refreshments and lots of interviews going on through the day at official times as well as in the corners where old friends can often be seen in animated discussion. I also consulted with a couple of teams and one even gave me a room which cut down significantly on my bills and allowed me to eat very well indeed at the wonderful breakfast and lunch buffets to be had daily at the hotel. I was in Bali, Indonesia from 1-4 December to conduct the first ever FIDE Seminar for Coaches in Indonesia and I am now writing this in Sri Lanka where I would be doing two national seminars in the next few days before rushing back late on 12 December for the KL Open. This seminar was organised by Gunadarma University under the auspicious of the ASEAN Chess Academy (as the FIDE Regional Academy for Asia) and is endorsed by PERCASI (Indonesian Chess Federation). A total of 23 participants took part, 21 local and 2 from Malaysia, and because they came from all over Indonesia and found the cost extremely expensive, and yet wanted badly to learn, most had to travel several days over sea and land just to attend. What I would like to share from my experience teaching this seminar is that in general the Indonesian participants demonstrated a high level of tactical ability (as is their traditional strength) and only needed structure and systems to harness their natural passion and enthusiasm to play and now to also teach chess. Most also had their own successful schools and there was a recognition not only of improving their skills but also that such qualifications were very important for their professional development. Indonesia despite its many challenges related to geography has now the biggest pool of young talent amongst girls in the world and I hope the seminar has helped many of these dedicated coaches continue their excellent work and perhaps even do an even better job! My compliments to Bunawan, the prime mover behind this seminar, who tirelessly organised and whom I suspect also personally bankrolled many expenses too because he understood its importance to development.